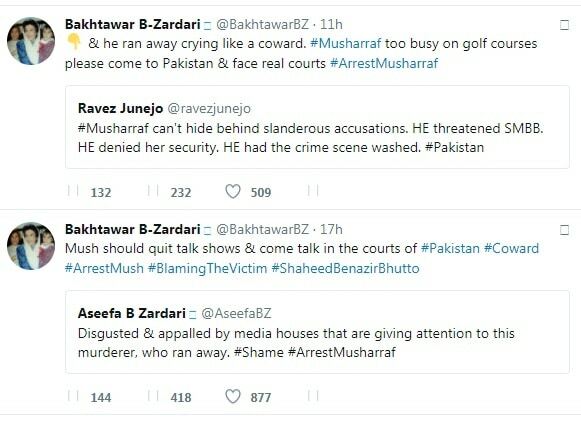 In a series of tweets, Benazir’s daughter Aseefa B Zardari said that it was indeed Musharraf who ran away after her mother was assassinated. New Delhi: Hours after former Pakistan President Prervez Musharraf accused Asif Ali Zardari of getting his wife Benazir Bhutto killed, Benazir’s daughters come out in support of their father and accused Musharraf of blaming the victim. Following her sister, Bhaktawar B Zardari also took to Twitter and slammed Musharraf, who was the President when her mother was killed. At the time of filing of this report, there was no responses from Zardari or his son Bilawal Bhutto Zardari. “Asif Ali Zardari is responsible for the Bhutto family’s demise and is involved in the deaths of Benazir and Murtaza Bhutto,” Musharraf said in a video posted on his Facebook page.